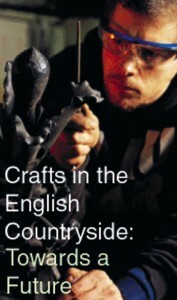 In the conclusion to The Crafts in England’s Countryside: Towards a Future Report (Countryside Commission 2004) Professor E.J.T Collins stated that ‘..the decorative crafts contribute an estimated £1 billion to national income; the rural crafts, including the building trades, perhaps £300 – £350 million’. The study did not claim to take in all sectors of craft-related activity in rural areas, missing out significant areas of non-traditional or community-based rural and farming craft activities, which we think are also important in the context of the Creative Rural Economy. Crafts not included in the Countryside Commission publication include rural land management crafts and skills which although less available to urban consumers are vital to rural tourism, heritage and other landscape-based areas connected with the Creative Rural Economy. These include traditional rural craft skills associated with animal husbandry, animal welfare and rural veterinary practice; hedge-laying, coppice crafts, walling and fencing, horticultural skills; rural community crafts and amateur arts and craft activity in villages and market towns, which make a significant contribution to a range of value-added products and creative capital in the local economy; farm-based metal crafts, design and repair of innovative farm machinery, equipment and animal handling systems; and rural craft skills to do with conservation and outdoor recreation. The Creative Rural Economy is further boosted by the numerous small craft and design-based businesses locating into new rural spaces, occupying barn or shed conversions or the purpose-built workspaces now becoming available. Examples include: furniture designers/makers, architectural product designers, makers of children’s clothing, toys, digital games, craft products associated with horse riding, high-end outdoor recreation and sports wear, and a wide range of ceramics, glass, carpets, wall hangings, and ecclesiastical garments and ornaments. Less well documented perhaps is the emergence of interesting craft forms associated with micro-industry, pharmaceuticals, bio-technology, culinary arts, and new digital/technologies interfaces with traditional rural crafts and wood working. Farming and fashion – new rural textiles, fibre art, and countryside clothing. An as yet undocumented design /craft contribution to the Rural Creative Economy is the high-end range of country clothing and fashion wear makers, textile designers, milliners, fibre artists, furnishing designers, and related craft/design and marketing businesses. These, when taken along with the myriad of home-based, part time, or amateur practitioners of textile art and crafts, dress-making and home knitting, suggest that the contribution made to the rural economy by this sector is likely to be significant. Another growing area of innovative rural textile design lies in the new interface linking, farming, fibre crops, and fashion, the processing for example of farm-grown hemp, flax, nettles, and leather and wool from an enormous range of animals in the production of sustainable textiles, clothing, footwear, and fashion wear, such as are being pioneered by the Bio-Regional Group. Contemporary crafts and the rural economy. Perhaps the most significant as yet undocumented contribution to the Creative Rural Economy is that of the contemporary crafts. It is likely that this, once documented, will be found to constitute a new creative rural sector which could in time grow to match or exceed the figures currently quoted for the traditional rural crafts. Following recent small scale regional and local surveys we believe that a national survey would show the scope and quality of the contemporary craft activity in rural areas to be extraordinary. The significance of the contribution made to the Creative Rural Economy could prove something of a revelation to the statisticians documenting the impact on the economy made by the Creative Industries. The RCF has been lobbying for a number of years for an independent study to be undertaken of the economic contribution (including the equally important social and environmental benefits) provided by the contemporary crafts in rural areas. Two US pioneers of new textile/installation art and contemporary basketmaking are artists, Gyongy Laky and willow installation sculptor Patrick Dougherty. 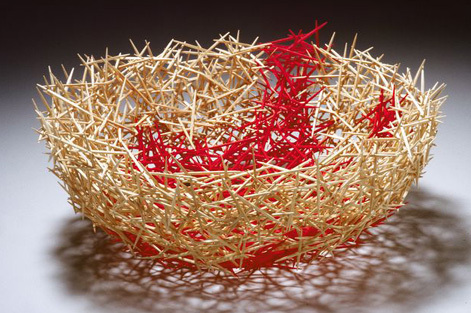 Gyongy Laky has also been influential in promoting contemporary basket making-as-art in both urban and rural creative industry contexts. And Patrick Dougherty has pushed traditional willow crafts into new and quite extraordinary architectural contexts and landscape applications. In a British and European context the work of David Drew and the Basket Makers Association, have also done much to reposition contemporary willow basket making and woven sculpture in the public realm. The Danish KURV project is another example of new basket making initiatives in outdoor rural contexts. Also not to be overlooked is the wide range of home-based rural textile crafts, clothing design, fashion wear and natural fiber arts activity – rug making, felt making, weaving, high-end furnishings and upholstery and outdoor country fashion wear. Two examples being the Amplebosom outsize lingerie marketing company and the Wooly Rug Company projects, and both businesses operating very successfully from rural bases and hill farming communities. Farming and fashion can be fun too. In brief the contemporary rural craft and design sector, including textiles, fashion, furnishings and experimental bio-technological craft/design products and ’smart’ interactive clothing, will prove to be one of the key drivers of the future Creative Rural Economy. In addition to enhancing and sustaining rural community creativity, cultural capital and social cohesion, the contemporary crafts and textiles generate new employment opportunities for professional craftspeople and designers from both urban and rural backgrounds. Moreover, the contemporary rural crafts are well positioned to make a significant contribution to the cultural discourse and strategic initiatives now being proposed in support of the Government’s agendas for environmental and economic sustainability. The RCF is in contact with the Craft Council as to the possibility of developing a New Rural Crafts/Textile initiative. This includes outline proposals for a major national contemporary rural crafts and design study of the economic contribution produced by the sector, and a public engagement programme comprising an international conference, exhibition and publication, The new role for contemporary craft and design in the context of the post-agricultural rural economy’.